Nora, I have eczema (and maybe a little rosecea) on my face. It’s driving me crazy and so is the thought of taking medication for ever. Are there any good skin products for those conditions???? ANSWER: Wow–I’m playing beauty expert today, so I guess I should mention that my opinion is purely experiential and definitely NOT based on real medical or even esthetic knowledge. But, yeah, dry skin totally tends to appear either during cold weather or in super dry heat: fire weather, they call it here in LA. Not sure if that’s better or worse than earthquake weather? ANYWAY, you may need something prescription, if it’s serious. But, in my purely observational experience, for very mild cases or for preventative purposes, deep shea butter HAND lotions like Mistral’s Creme Mains can really help dry skin on the body (and these smell like heaven). 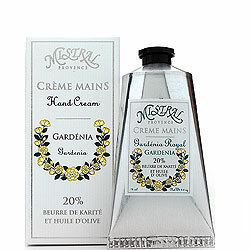 Hand creams just tend to be richer than body lotions; especially in concert with powder like Gold Bond (yup, the jock itch stuff) and even OTC Cortizone Cream in small quantities. For the face, I would also search out shea butter products cause it really is a miracle ingredient, not an irritant (for me at least) and, well, I’m just OBSESSED. A heavier night cream like Kinara’s Intense Moisturizer with peptides could be good too, but, if you’re acne prone, use it only as a spot treatment on dry areas. As for the redness prob, an esthetician recently told me that rosacea is the most over-diagnosed problem in skincare. These days, it seems like everyone is lactose intolerant, wheat intolerant, ADD and covered in rosacea. You may just be having a sensitive reaction to a product. Try being really gentle with your skin: DEFINITELY do not use grainy exfoliants in those areas. Glycolic acids can be too extreme for a lot of people too, so don’t overuse that either. Another esthetician once told me not to be afraid to use different products on different parts of my face, depending on the areas’ needs. It seems obvious, but it never occurred to me and I think it’s actually genius advice. Also, a good friend in NYC uses a bunch of rosacea products she likes: Lucrece Innovative Skin Technology Rosacea Creamy Cleanser by Physicians Aesthetic Research (though she says their products can be pricey), B. Kamins Chemist‘s Rosacea line (which includes a blue concealer to counteract the red appearance) and (her fave) Eau Thermale Avène Antirougeurs Apaisante SPF 25 (which she uses over her normal moisturizer for both sun protection and its blue tint). Hi, I have hyperpigment areas on my face from hormonal fluctuations. Can you recommend products to lighten these areas and make them go away forever?? Thanks! 1. Dermalogica just launched new technology for lightening sunspots and evening the overall tone of your skin called, ChromaWhiteTRx. Basically, the approach is less of a band-aid than past products because it includes an entire regimen catered to this specific purpose. So, the package includes a spot treatment (as you’d expect), but also a cleanser, vitamin C serum, exfoliant etc. I guess that previous products only dealt with the top layer of skin, but, after researching, Dermalogica found that the spots would just reappear because darkening melanin collected under the surface. This product is meant to actually slow the production of melanin. Anyway, worth a try? An exec showed me the change in her own skin and it was pretty noticeable. You have to be diligent about using the products though. Also, you can head to a Dermalogica spa, where an esthetician may be able to prescribe the most beneficial products, if you don’t want to buy them all. 2. The above kit comes with an SPF 30, but if you (like me and many skincare experts) have developed an innate fear of sunblock (both because of toxins and acne breakouts), you can try out a mineral makeup (which has inherent sun protection) from lines like Laura Mercier, TRUE or the less pricey Physician’s Formula. I’ve had great experiences with all three of these actually, BUT, since I’m really fair-skinned, I need extra coverage. 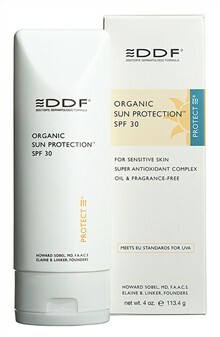 So, at the suggestion of a skincare insider, I’ve started using DDF Organic Sunblock with mineral makeup on top and I haven’t been breaking out from it at all. And I was suspicious because I tend to have allergic reactions to”natural” products. 3. If you’ve got the cash and you’re in LA, head to Kate Somerville Skin Health Experts on beautiful Melrose Place (truly love!) and let them just zap it away in a few sessions. I did just one session before my wedding and it made a HUGE difference. Ask for Melissa! (They also happen to have the world’s tastiest spa water–yum). Can I ever not think about food?